Article by Max Goodwin Brown ©. Dimitris Lyacos’s Z213: Exit, translated into English by Shorsha Sullivan and published by Shoestring Press, is not an easy book to write about. The difficulty is directly comparable to that of trying to recount a troubling dream. As in a dream, the book’s imagery is by turns vivid, strangely familiar, and frustratingly elusive, leaving the reader with profound impressions that seem to dissolve the moment any attempt at describing them is made. Even tracing these impressions back to their source, the text, is tricky. Z213 is a book of evocations. On returning to it, the reader finds that some of the work’s most disturbing, powerful, and personal images were not in the text, but triggered by it. The first problem the reader encounters is a narrative one. It is not that Z213 has no story; it does. Nor is it that the story is particularly fantastical or incongruity-filled; on the contrary, the whole thing feels both consistent and uncannily real. But just as one must impose narrative frameworks on one’s own dreams in order to sensibly describe them to other people, so the reader must be selective when pulling a story out of the swirl of indistinct imagery that is Z213. Certain things come through more persistently than others: a soldier, a train journey, a Bible with handwritten notes in the margins. There are memories of a place left behind, a place by the sea, a prison camp, or maybe a hospital; either way, it is a place that the protagonist, and that, before long, the reader, is desperate to get away from. There are distinct differences between the two voices. The first, demonstrably the soldier’s, is doomy and monotonous, the second frantic and fractured. The reader hears more from the first than from the second, but both are there throughout the book, interrupting and occasionally talking over each other. The cumulative effect is not of a split personality but of a broken time cycle. As the story unfolds, a nauseating feeling of futility creeps in. The reader begins to wonder if perhaps the soldier has not succeeded in effecting the escape he believes he has. …the sun leaves the station chases you, goes up, moves in front of you, find where you had stayed, search, there or someplace else, on the grey facades that do not recognise you, what do you remember of the road that is lost, turn back to a corner and sit down for a while, and once again, the roads you are changing, hours that you wander, old women looking at you through the window grow larger grow smaller you walk without coming out anywhere, the roads grow wider narrower bend beneath your feet rise go up again, you get up sit go a bit further, ask someone, enter, church crowded, remember something go out again, others along with you, the bell, the door unlocking porter, you enter behind them to the end of the corridor, then on the right and up the staircase, thick glasses, and a red stain under his nose, he paid no attention to you or took you for someone else, how could he make you out him looking from the light into the dark, or he doesn’t see well, go up the stairs, to the top, lie down, cover yourself, it is still too early to sleep. 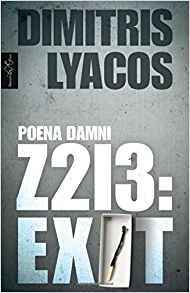 Lyacos’s great strength, here and throughout his Poena Damni trilogy, of which Z213: Exit is the first installment, is his ability to create a sense of depth, to make each page a membrane, permeable and partially translucent. The reader is constantly hearing echoes from other places, constantly aware of something…moving…just over there. It’s disorienting. And it’s partly this that gives Z213 its bad-dreamlike feel. A range of well-known tricks of twentieth century experimental literature are either utilised or alluded to throughout: there are the long, unpunctuated sentences of stream-of-consciousness; the blocks of fragmented text reminiscent of the cut-up/fold-in technique favoured by Burroughs and others; the ferocious pace of Beckett’s dramatic monologues; the handwritten notes that are presented like pieces of found poetry. But it’s not so much the techniques themselves as the schizophrenic way in which Lyacos juxtaposes them—jumping from one to the other and sometimes using several simultaneously—that give Z213 its murky, multi-dimensional feel. With so many ideas and stylistic switches to contend with, the reader’s head inevitably becomes filled with pictures that are distorted, half-finished, and seemingly subconscious in origin. Mist, when I used to go out from the side with the beach. Looking away as far as I could. Of demons’ necks stretched on high. And then again in the dark of the dormitories. This beat again coming behind me, slowly. Broken slabs. My footsteps’ echo. A hand as if from a statue. Smashed under my feet. Some bird trapped in here. Maybe rats. Could be, here in the hollows. Statues of rats in the holes. That sound of footsteps again. The echo. I sit down. Silence. Silence. That sound again. Now behind me. Who. Z213: Exit is by no means an optimistic book. But it is not exactly a pessimistic book either. In fact, it lacks any sense of future-orientation. What the reader is presented with is a journeying man who does not appear to be getting anywhere, a man who is alone in the dark, with his thoughts and with his memories, unsure where the former end and the latter begin. Z213 reads like a bad dream, full of menacing and familiar shapes. No other writer can evoke the blurry, ambiguous feeling of dreaming quite like Lyacos. His work has been described as ‘apocalyptic’ and ‘eschatological’. ‘Purgatorial’ might be nearer the mark. Where else but in a dream does one grapple, over and over again, with one’s own soul in all its grisly glory? Max Goodwin Brown is a writer and reviewer. He grew up in London, studied philosophy in Aberdeen and Amsterdam. His short stories have appeared in Structo and the Penny Dreadful. His reviews have appeared in Versal Magazine.